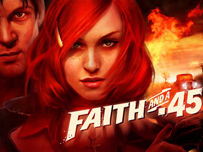 Deadline Games has announced it’s working on a “gritty, emotional shooter”, Faith and a .45, for PS3, Xbox 360 and PC. The Denmark-based independent developer says the game will feature a heavy focus on characters, co-operative gameplay, road movie storytelling and cinematic aesthetics, and will tell the story of two outlaw lovers against the backdrop of the Great Depression. "Since we at Deadline have our roots in movie production, we value original stories, settings and characters very highly," said Deadline CEO Chris Mottes. "Our previous games are testament to this, but we believe Faith is going to take our creative might to a whole new level." The Nordic developer, founded in 1996 as a production company in film, television and interactive entertainment, but which now focuses exclusively on game development, will be presenting the game to selected publishers at the 2008 Game Developers Conference in February. It was previously responsible for Total Overdose and Chilli Con Carnage.